H. Beam Piper’s “Little Fuzzy” (1962) was about the discovery of a small, cute, furry mammal on the planet Zarathustra, and the battle against the Charatered Zarathustra Company to have the Fuzzies recognized as intelligent natives. Now John Scalzi has rewritten the same story, but with plenty of big differences. Fans of Piper’s Hugo-nominated novel can debate whether the original needed a revision, but none can deny that Scalzi’s version is enjoyable in its own right. Science fiction TV and movie series are rebooted all the time — see Battlestar Galactica and Star Trek for recent examples of this — but I can’t think of a significant, original universe in science fiction literature in which this has been done, at least, not by someone who is not the original author. So I thought, hey, this seems like it could be a fun thing to do. So I did it. Scalzi had not considered it to be commercial, but his agent disagreed and got the blessing of the owner of Piper’s literary estate to publish it. The basic plot is the same. Jack Holloway, a prospector on the newly-settled planet Zarathustra, finds an unknown small furry mammal he names a Fuzzy. He and his friends become convinced that the Fuzzies are intelligent, not wild animals. Zarathustra is run by a chartered company that requires the planet to be uninhabited by intelligent natives, so the company does all it can to discredit Holloway and exterminate the Fuzzies. All the details are different. Piper’s Jack Holloway is a lone, elderly, experienced prospector. Scalzi’s Jack Holloway is a young man with a dubious past and an ex-girlfriend, Isabel Wangai, who works for the planetary company. Holloway also has a companion, the dog Carl who is trained to set off prospecting explosions. The relations between Carl and the (lower-case) fuzzies, which Scalzi describes as a “cat thing”, are humorous. In this novel, it is Isabel who first becomes convinced that the fuzzies are sapient while Jack still thinks they are just clever animals. Zarathustra is now “Zara XXIII”; the Chartered Zarathustra Company (CZC) is “ZaraCorp”; and Zarathustra is not the name of a planet but of the megacorporation headquartered on Earth that “Explores & Exploits” many uninhabited worlds throughout interstellar space. The Terran Federation is the Colonial Authority. It would be tedious to list all the differences between the two novels. The main point is that they are different enough that readers of Piper’s novel will find Scalzi’s version fresh and full of surprises. There is still a big courtroom trial at the climax, but Scalzi presents it with total originality. The only complaint is that, for furry fans, Scalzi’s fuzzies do not play as large a role as Piper’s. They serve as background characters for most of the story. But they are still prominent enough that “Fuzzy Nation” is a book that furry fans will enjoy reading. 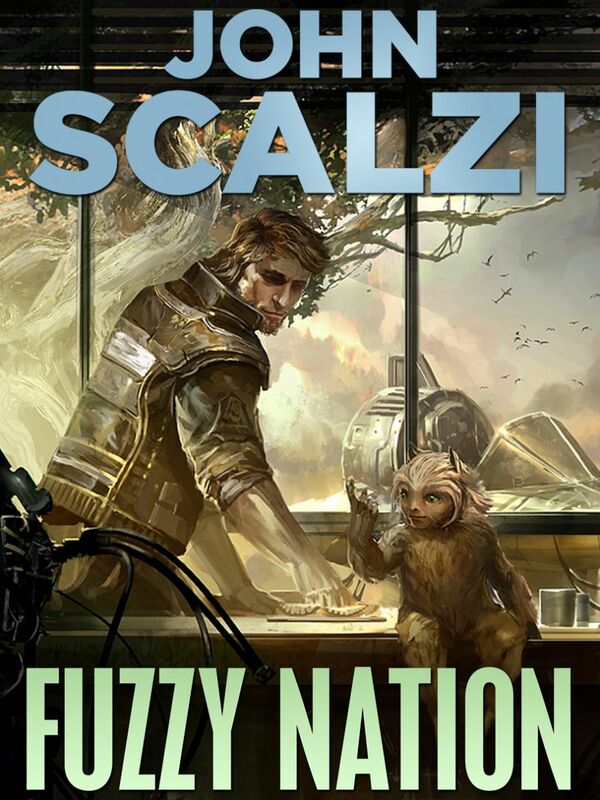 “Fuzzy Nation”, by John Scalzi — NYC, Tor Books, May 2011 — Hardcover $24.99 (301 pages), Kindle $11.99. Nobody ever seems to write this kind of story from the corporation's point of view. Those responsible for the situation are the politicians who made such a dumb law in the first place. Their action led ZaraCorp to go to extreme lengths to protect their investors. And for what? I bet the fuzzies have no use for the sunstones anyway.